Rating of multileg slings adjusted for angle of loading between the inclined leg and the horizontal plan of the load. *Other grades of the proof tested steel chain include Proof Coil, BBB Coil and Hi-Test Chain. These grades are not recommended for overhead lifting and therefore are not covered by this code. Slings are designated throughout the industry by the symbols. 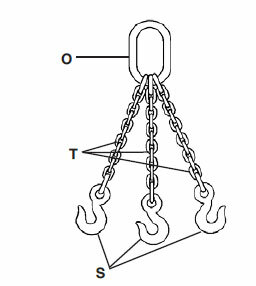 First Symbol (Basic Type)S Single Chain Sling with master link and hook, or hook each end. C Single Choker Chain Sling with master link each end. No hooks. 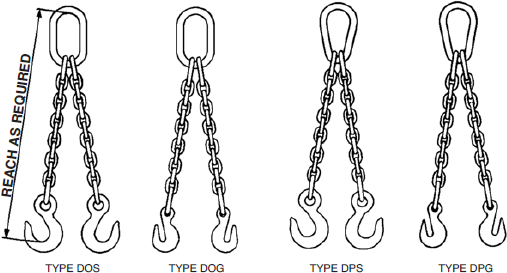 D Double Chain Sling with standard master link and hooks. 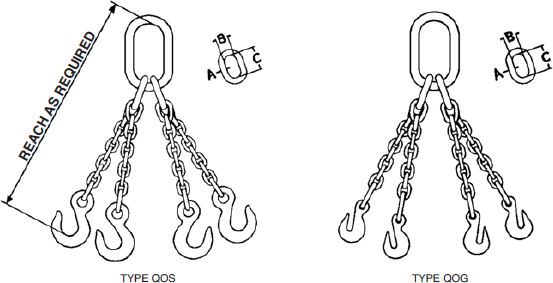 Q Quadruple Chain Sling with standard master link and hooks. Second Symbol (Type of master link or end link)O Standard Oblong Master Link – Recommended for all types. Inspect before use. Follow OSHA, ANSI B30.9 or Manufacturers Guidelines. Use by untrained persons is hazardous. Improper use will result in serious injury or death. Do not exceed rated capacity. This product will fail if damaged, abused, misused, overused or improperly maintained.